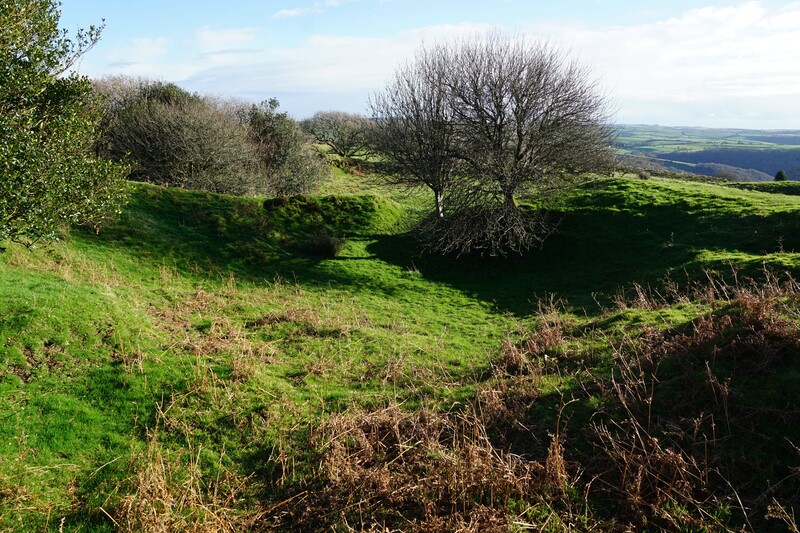 Blackdown Rings consists of the remains of a late Bronze Age/early Iron Age univallate hillfort and a medieval ringwork-and-bailey fortification known as Loddiswell Castle. Both were built to dominate the Avon valley and control access between central Dartmoor and the sea. Blackdown Rings was a univallate hillfort that was probably established in the Late Bronze Age or Early Iron Age to dominate the River Avon. This waterway was once an important artery of communications which connected central Dartmoor with the sea and was also an important economic asset that boasted a wealth of natural resources including a healthy Salmon population. The fort was built upon the eastern slope of the hill and was deliberately offset from the summit, presumably as its owner wanted the structure to be clearly visible from the river. 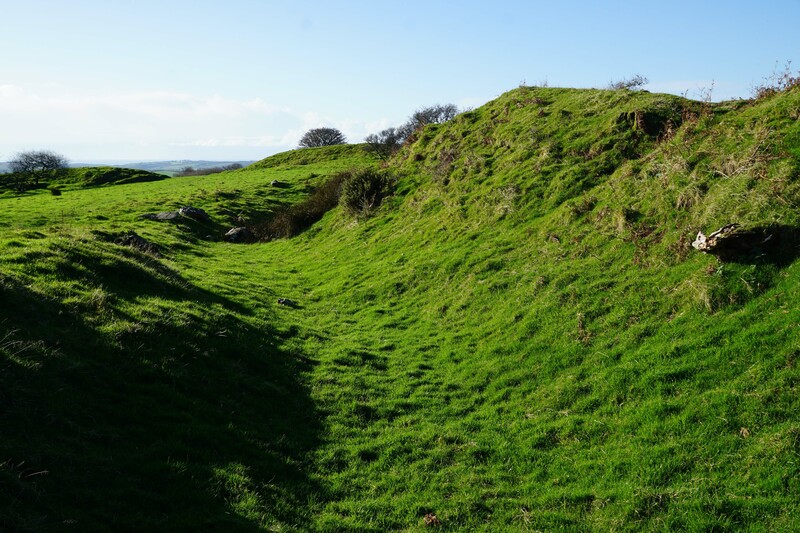 The hillfort's defences consisted of a single stone revetted rampart and a seasonally waterlogged ditch. The rampart was constructed using spoil from the ditch and the spare waste was used to create a counterscarp bank. There were entrances on the East and West sides which would originally have been barred by timber gates and accessed via a causeway across the ditch. The fort had an oval footprint and enclosed an area of around six acres. 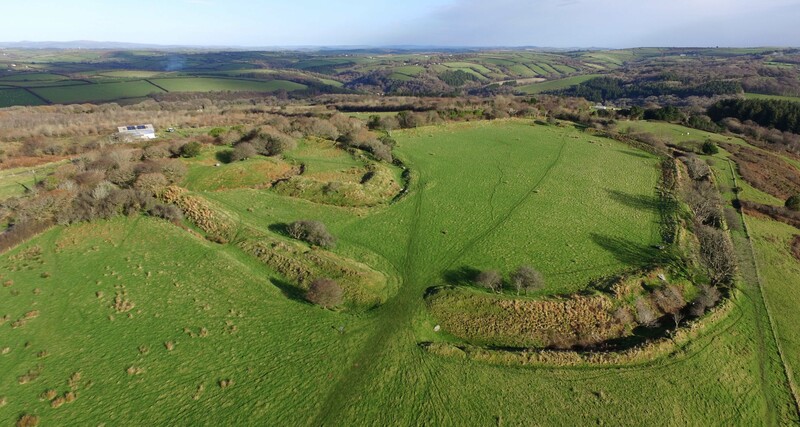 It is not known how long the site was in use but there is no evidence that the defences were rebuilt during the later Iron Age which suggests it was probably abandoned after a few hundred years of operation. Loddiswell village, located two miles to the south and significantly closer to the river, was probably founded as its replacement. 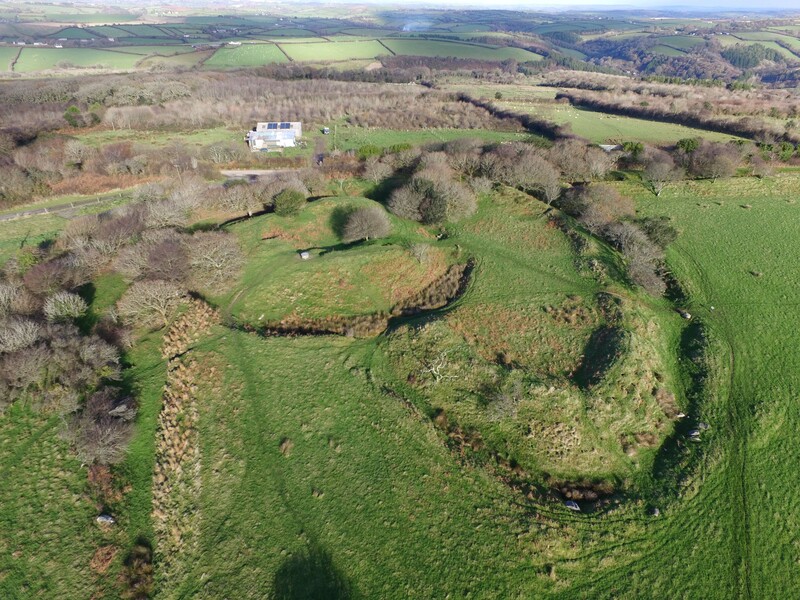 Shortly after the Norman invasion, an earth and timber ringwork-and-bailey fortification was built in the north-west corner of the earlier hillfort. Known as Loddiswell Castle, this was probably built during or immediately after a major Norman campaign to suppress resistance in the South West. In 1067 a major rebellion had erupted centred on Exeter and led by Gytha Thorkelsdóttir, mother of King Harold who had been killed trying to repel the Normans at Hastings. Between December 1067 and March 1068, the full might of the Norman army swept into the area, captured Exeter and imposed their will across the wider area. One of the key commanders in this campaign was a Breton Knight known as Juhel (also known as Judhael). He was granted huge swathes of Devon in reward for his services including Loddiswell. He immediately commenced construction of Totnes Castle to serve as his regional caput but he also probably built Loddiswell Castle to secure control of the Avon valley. Loddiswell Castle consisted of a ringwork and bailey. 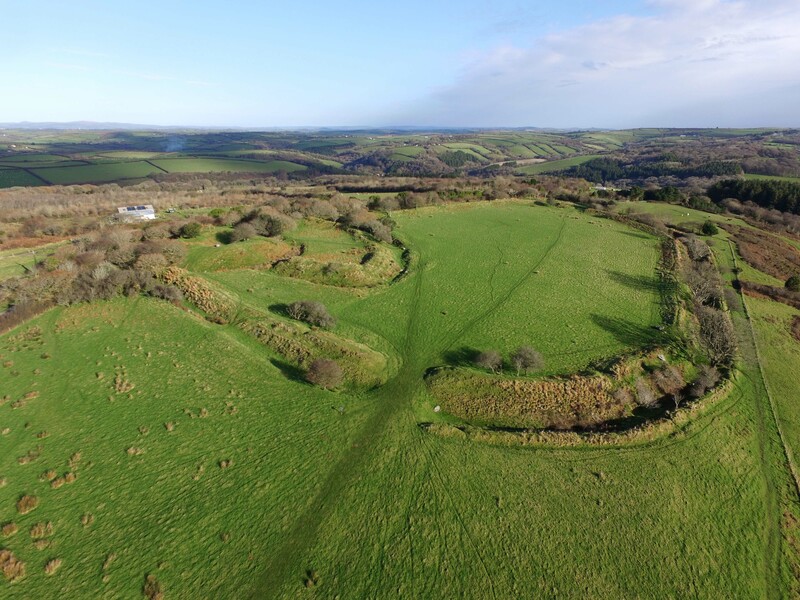 The ring was built over the hillfort's rampart and occupied the highest ground within the entire enclosure. 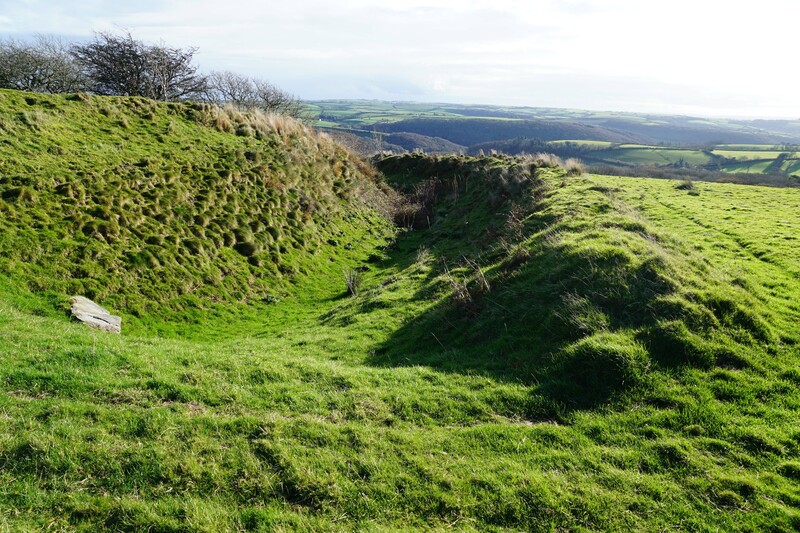 It was protected by a substantial earth rampart probably topped with a timber palisade and was surrounded by a V-shaped ditch except on the north-west where the existing hillfort ditch was deemed sufficient. 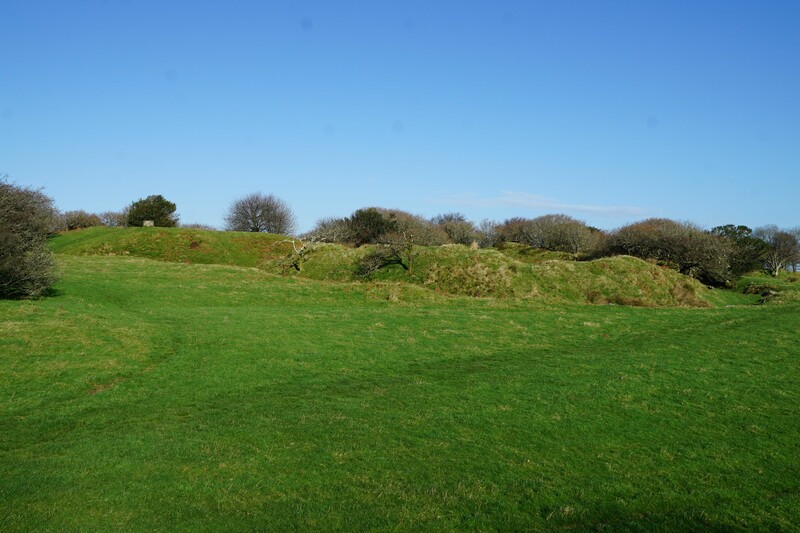 The interior of the ringwork was tiny - just seven metres in diameter - and was probably occupied by a timber tower. Extending to the east and south-east of the ringwork was an Inner Bailey. Like the ring itself, this was protected by an earthwork rampart separated from the hillfort by a ditch. 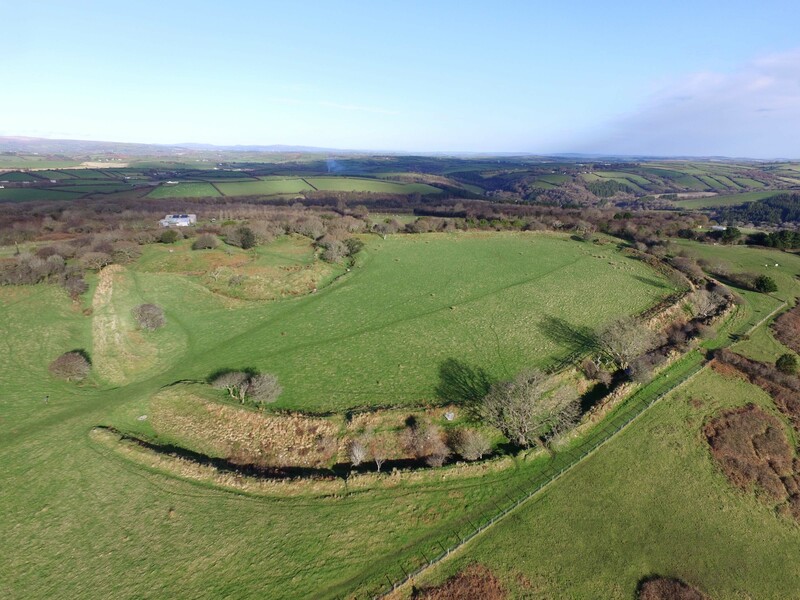 The remainder of the ancient fort was probably used as an Outer Bailey for containing livestock or, in the months following suppression of the 1067/8 rebellion, billeting an army. The castle was probably only occupied for a relatively short period although Loddiswell itself was clearly valued as an economic asset; the Domesday survey in 1086 recorded that it was a large settlement consisting of 44 households and incorporated a profitable Salmon fishery which was required to pay 30 salmon each year to its Lord. The site later passed into the hands of the church but, following the English Reformation, it was purchased by Sir Thomas Arundell. In 1591 he gifted it to the Arundell Charity “for the use, good and behoof of the parishioners of Loddiswell”. A beacon was erected on the site before 1752 but has now been removed. Carpenter, D (2004). The Struggle for Mastery. Penguin Books Ltd, London. Douglas, D.C and Whitelock, D (ed) (1979). English Historical Documents Vol 1 (c500-1042). Routledge, London. Historic England (1997). Blackdown Rings prehistoric hillfort and medieval castle, List entry 1016258. Historic England, London. Huscroft, R (2009). The Norman Conquest: A New Introduction. Pearson Education Limited, Harlow. Reynolds, A.J (1999). Later Anglo-Saxon England: Life and Landscape. Stroud. Sweeney, S (2016). History of Loddiswell. Blackdown Rings comprise of the earthwork remains of an Iron Age hillfort and a medieval ringwork-and-bailey castle. Blackdown Rings. The fort was situated to the south of the hill's summit and the entire site slopes gently to the south-east. This would have meant the hillfort would have been clearly visible to anyone moving along the river. 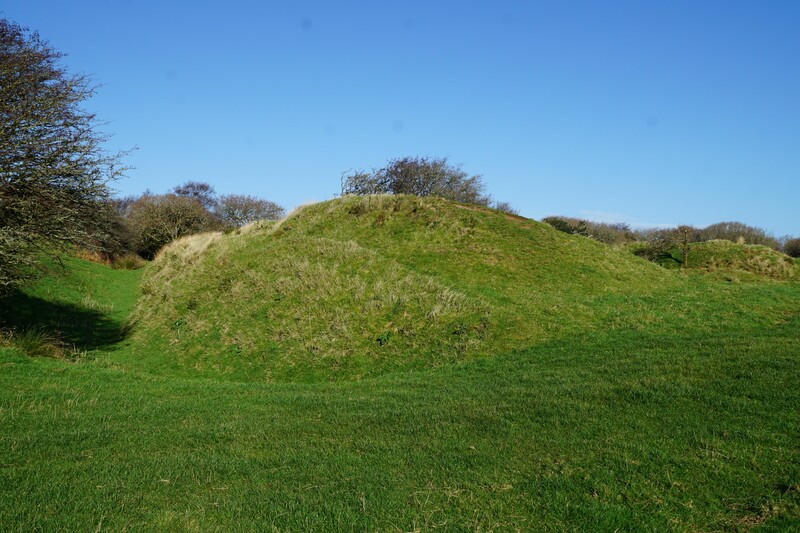 Hillfort Defences. 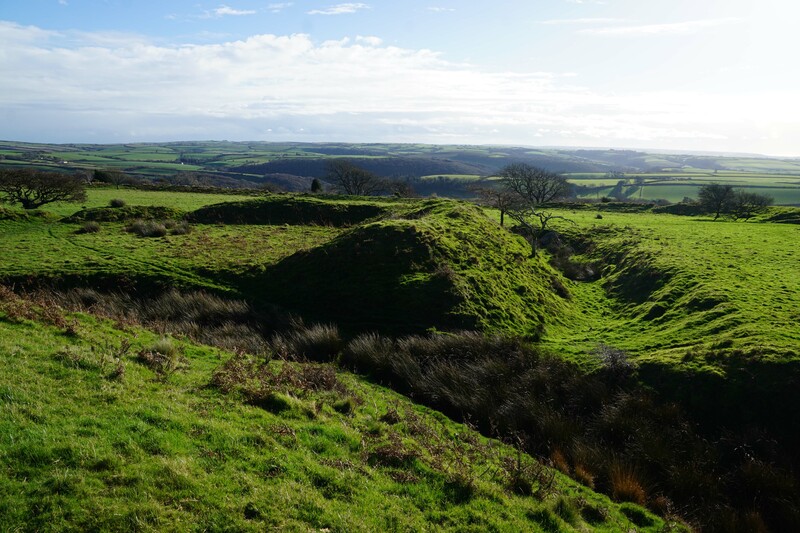 The hillfort defences consisted of (from exterior to interior) a counterscarp bank (left), ditch (centre) and rampart (right). The first and last were constructed using spoil from the ditch. The rampart was originally revetted in stone hence the steep scarp on the outer face. Hillfort Interior. 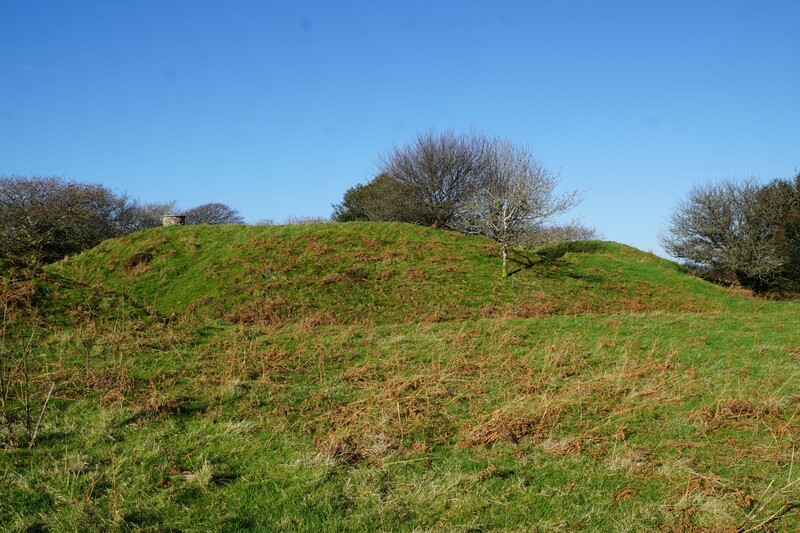 The hillfort occupied an area of six acres. Loddiswell Castle can be seen in the centre of the photograph. Loddiswell Castle. 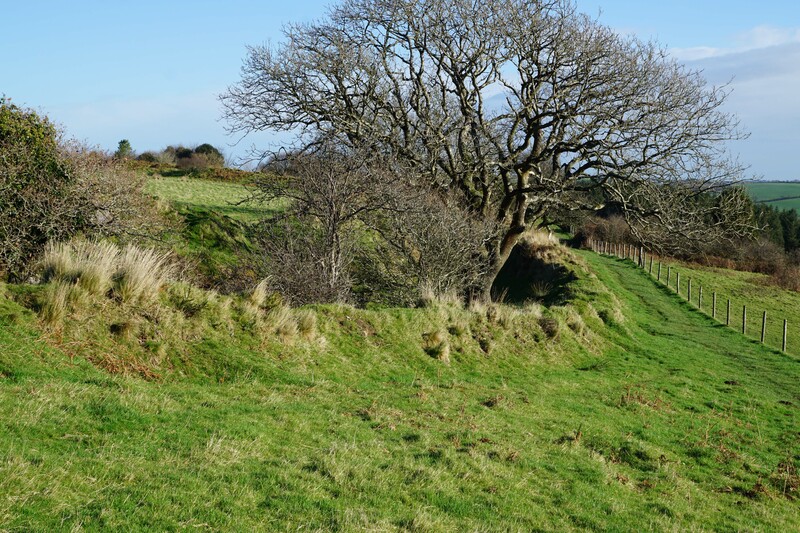 The castle was ringwork and bailey fortification built in the north-western corner of the hillfort. Ringwork. The ringwork entrance was via a narrow opening in the rampart. The internal area within the ring was just seven metres in diameter. Bailey Defences. 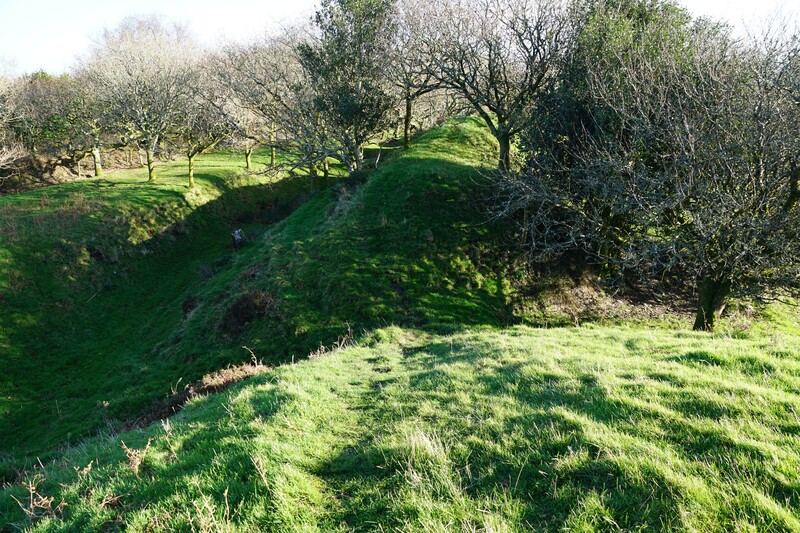 The bailey was protected by a ditch and rampart. Blackdown Rings is found off the B3196. Take the turning sign-posted to Hazelwood. There is a small car park adjacent to the hillfort.